Kyrgyzstan, a landlocked country in Central Asia bordered by Kazakhstan, Uzbekistan, Tajikistan, and China has a total land area of 77,181 square miles and a population of over 5.4 million. Though Kyrgyzstan is currently among the poorest countries of Central Asia, it is rich in mineral resources such as coal, gold, uranium etc. The export sectors are hydroelectric power and livestock rearing resulting in wool, meat and dairy products. Agriculture, though primitive in approach is also a major sector of the economy. The government is working to lift the country’s lot by attracting foreign investment to its metallurgy and agriculture industries. May through October is the best time to visit this country. Such is its natural beauty that it qualifies as the top attraction of the land – the mountains, the lakes and the valleys paint pictures no canvas can truly capture. Museums, hot springs, forests, mountains are all on offer here. Golden Spa, Dialal Abad, Arslanbob, Lenin Peak and Tash Rabat are well-visited places. Kyrgyzstan cuisine is very varied and is mostly mutton and horse meat based. Food tends to be high in fat content, but extremely tasty fresh from the grill. Lagman (noodles), Manty (dumplings), Paloo (rice pilaf), Shorpa (soup) and Nan (flat-bread) are everyday dishes. 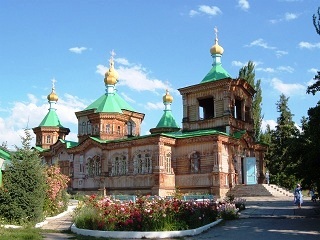 Kyrgyzstan Bradt Travel Guide 978-1841622217 $18 Practical travel information followed by region-wise coverage on Bishkek, Chui Province, Lake Issyk-Kul – North Shore, Lake Issyk-Kul South and the Central Tien Shan, Talas Province, Naryn Province, Jalal-Abad Province, and Southern Kyrgyzstan. The first stamp of Kyrgyzstan was released on February 4, 1992 showing the Sary-Chelek Nature Preserve. The stamp (Scott #1) is inexpensive and catalogs for a few cents. As the country has only released about 300 stamps in its 18-year history, it is relatively easy to acquire a complete collection. Most of the stamps are inexpensive as well. The country became independent following the breakup of the Soviet Union. Sary-Chelek Nature Preserve is a designated World Biosphere reserve by UNESCO located in the Jalal-Abad Province. A set of seven stamps along with a souvenir sheet showing Sites and Landmarks was also released in 1993. The set (Scott #5 to #11 and #12) catalogs for around $3 MNH or used. The designs show petroglyphs, 11th century Tower, Mausoleum, Yurt, Statue of Manas of Pishpek (Bishkek), Commercial Complex in Pishpek, and Native Jewelry. Epic of Manas is an epic poem of the Kyrgyz people. Manas is the epic’s hero. The poem has close to 500,000 lines and is regarded as the centerpiece of Kyrgyz literature . A set of six stamps and a souvenir sheet released on December 1, 1994 in the Minerals theme. The set (Scott #41 to #46 and #47) catalogs for around $6 MNH or used. There is also a miniature sheet of 6 (#47a) that catalogs in the same range. The designs show fluorite-cinnabar, calcite, getchellite, barite, orpiment, and stibnite. Kyrgyzstan is rich in mineral resources with significant reserves of coal, gold, uranium, etc. A set of seven stamps and a souvenir sheet released on October 16, 1995 in the Horses theme. The set (Scott #72 to #78 and #79) catalogs for around $5 MNH or used. Horse riding is the traditional national sport of Kyrgyzstan. Several games including the Ulak Tartysh team game are popular in Kyrgyzstan. A set of three stamps, a souvenir sheet, and a label released on July 7, 2001 depicting Mountains. The set (Scott #160 to #162, and #163a-c and label) catalogs for around $5 MNH or used. The designs show Mountains along with horses crossing stream, grazing animals, and valley. Over 80% of the country is mountainous covered by the Tian Shan mountain range earning it the nickname “Switzerland of Central Asia”. Skiing is yet to be developed although skiing is possible for tourists at the base of Toguz Bulak and in the Karakol Valley National Park. The first coins of Kyrgyzstan were Silver Som Proofs issued in 1995 in the Millenium of Manas theme showing Arms within Circle and Date flanked by Sprigs in Obverse and Armored Equestrian above Mountains and denomination in Reverse. The issue has low mintage (20K) and catalogs for around $50. The first gold coin (0.2 troy ounces) was issued soon after in the same design. That issue has very low mintage (5K) and catalogs for a premium over bullion value. Coins $10 and up Recent UNC year sets start around $10. Silk Road Proof Sets start around $50. Low mintage silver color proofs go into the 100s. Paper Money $1 and up Common UNCs start around $1. First Issue Sets of 1993 in UNC start around $10. Bundles start around $25. Uncut sheets and other rare issues start around $50. Visitors are attracted to dolls in traditional costumes, pottery, embroidery, leather, woodwork and kymyz (an alcoholic drink made by fermenting mare’s milk).